Try our scrumptious new recipe, great for every occasion. Topped with delicious blueberries, this recipe is ideal for family get-togethers. 1. Preheat the oven to 160°C, (140°C for fan ovens), Gas Mark 3. Double wrap the outside of the cake tin in foil. Place the cookies in a food processor and pulse till finely ground. 2. Melt the butter in a pan, then add the ground cookies and heat very gently for 1-2 minutes, stirring until the chocolate is slightly melted. Press into the base of the tin and chill for 10 minutes. 3. Beat the cream cheese until soft with an electric hand mixer (or in a food processor). Gradually add the condensed milk and then add the remaining ingredients. Beat until very smooth. Gently pour the mixture over the set biscuit base. Give the tin a tap on the work top to release any air bubbles in the mixture. 4. Sit the cheesecake in a roasting tin. Pour very hot water into the roasting tin to come halfway up the sides of the cake tin. Bake in the centre of the oven for 1 hour. Turn off the oven without opening the door, and leave for 1 hour to set. Cool and then chill for 4 hours or overnight. Remove from the tin and serve. 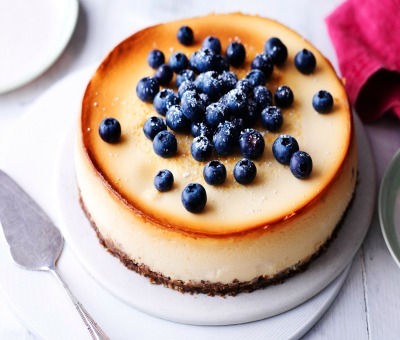 Finally, use the blueberries and a dusting of icing sugar to decorate the cheesecake.